Wow I sure enjoy the map/table stuff and all your hard work Baggss, will you continue with the map? Fall FY 18 Rev 1 update posted. I can't wait until it is light green. Winter 2018-2019 Map update posted. Table has been removed pending an update. Exprect a Revision shortly after the first of the year. Last edited by baggss; 12-05-2018 at 11:45 AM..
You’re such a tease to all of us CoCoCo residents. But at least we’re not red! Rev 2 of Winter 2018-2019 posted. Regarding the chart, I can confirm that Glendora has issued at least 2 permits. Someone I know just successfully renewed his permit and I met a Calgunner last year who had recently been issued a permit from Glendora PD. The former is a former GPD LEO, while the latter IIRC had rather exceptional good cause. Do you haven any links to Glendora PD's website that talk about CCWs? I don't live in Glendora, so I've never looked into it. I doubt either person went on a website first, especially the one that's retired GPD. The Calgunner who got one was given a really hard time by the PD about it before finally getting it, despite well-documented exceptional good cause. Yolo Co in yellow looks good! The only thing better is if it goes green. Hopefully, as CGNers apply and post re. their experiences we'll find out if either shade of green is justified. EDIT: For grins I did a GIF showing 2009, 2010 (with corrections, San Mateo and Ventura were both incorrectly assessed at the time), 2015 and 2019 maps. Gives you and idea of how things have changed in the last10 years. Last edited by baggss; 04-14-2019 at 9:52 PM.. Here's some history I posted in another thread. ... folks never though they'd see the day when OC, San Diego, Stanislaus, Solano and Sonoma counties would liberalize issuance. I even remember when Sacto was dark red before flipping to dark green (I think in summer 2010). OC flipped to dark green in 2014 Feb with our Peruta 3-judge panel win (accepted SD = GC), and then back to light green with our en banc loss in 2016 June (required minimal GC and proof of it). Gore liberalized issuance in San Diego Co roughly in fall 2017, going from light red to light green. 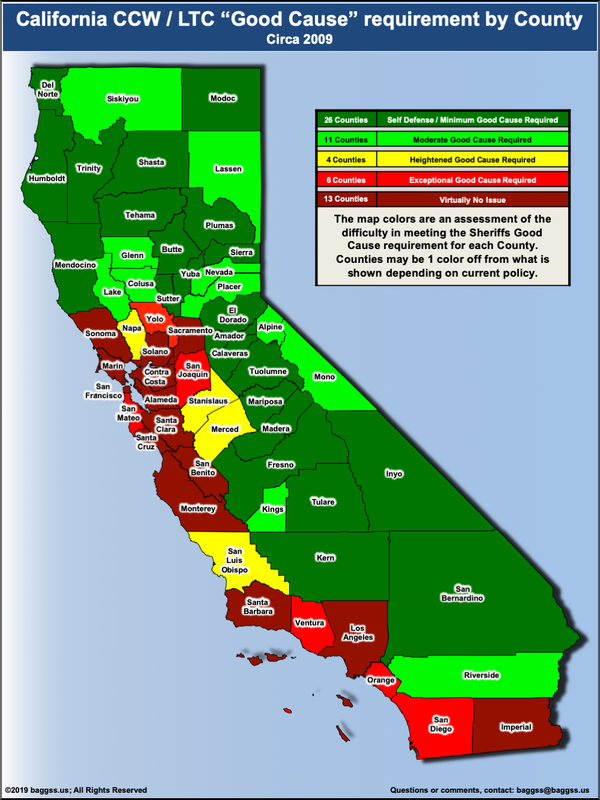 This old, 2010 map isn't quite accurate -- San Mateo Co never was light green, it was yellow for awhile at best. 2010 was a year of big improvements due to Heller (2008) and McDonald (2010) and the 2010 sheriffs' elections. San Joaquin flipped from light red to light green, San Benito flipped from dark red to dark green, Stanislaus flipped from yellow to dark green, Glenn, Lake, and Colusa all went from light green to dark green. So imagine what the 2009 map would have looked like. ETA: Some more history. Margaret Mims was elected Fresno Co sheriff in 2006 (and took office in 2007). In the 2010 map Fresno Co is dark green. baggss, if you have those old CA DOJ county-by-county CCW stats, you may want to review years 2006 through 2010 to see what Fresno Co was like before Mims and, if it was restrictive, to interpolate when Mims liberalized issuance and what color it was prior to that. ETA2: Donny Youngblood also was elected the sheriff of Kern Co in 2006. I wonder how Kern's issuance rates were in 2006 thru 2010. Last edited by Paladin; 04-14-2019 at 5:36 PM..
and it's image to compare to the current map in the OP. If he's legitimately retired, why would he need a CCW instead of just using his retired creds? Guns! More guns! I need more guns!